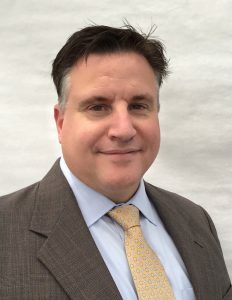 The TAC Board of Directors has appointed Justin Debord as CEO of TAC – The Abilities Connection (also known as TAC Industries). He began his new role August 1, 2018. Debord has stepped in for Mary Brandstetter. 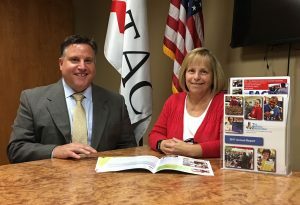 She is retiring August 24 after 41 years of dedicated service in the disabilities field, 7 of those years mostly recently as CEO of TAC. Debord recently retired after 25 years of active Navy military service at the rank of Navy Captain. He is thrilled to begin the next part of his career in the meaningful role as CEO with TAC. Debord is from Waynesfield, Ohio. He followed his grandfather into naval service. After graduation from The Ohio State University, Debord was commissioned as a Navy Supply Corps Officer. His last assignment was as Chief of Staff and Director of Strategic Contracting with the Defense Logistics Agency Land and Maritime in Columbus, Ohio. “Within the first 10 minutes of arriving at TAC, I knew I had found an incredible team I needed to be a part of,” he said. During his time in the Navy, Debord completed his master’s degree in Business Administration (MBA) at Michigan State’s Broad School and completed Executive training at Stanford. He learned real-world supply chain management, developed his leadership style, and honed his skills in both procurement, business development, and logistics that ensured success in senior leadership positions in Norfolk, Hawaii, Philadelphia, San Diego, and Columbus. In his most recent appointment, Debord was responsible for a $1.1 billion procurement operation providing spare parts support for the Department of Defense (DoD) land and maritime operations and systems. Part of his job was to advocate for organizations promoting disability employment such as SourceAmerica, AbilityOne, and the National Institute for the Blind. TAC produces new cargo nets and repairs worn cargo nets under an AbilityOne contract via SourceAmerica. His business acumen and military background should “ensure this critical work continues and hopefully grows to provide more employment opportunities for people with significant disabilities,” said outgoing CEO Mary Brandstetter. “We are fortunate to have found Justin, who has a wealth of experience and enthusiasm to lead TAC into the future,” said TAC Board Chair Cassie Barlow. “We are at a critical moment in our nation’s history for the rights and wishes of people with disabilities.” Debord’s partnering skills and track record of delivering results will be an asset to TAC going forward, she added. That attitude, combined with his experience and clear understanding of the mission of TAC, will provide leadership for everyone in the organization going forward.